Reaches full speed and torque in less than 50 milliseconds and stops within 25 milliseconds, eliminating deadtime. Low current draw of 0.16 A to 3.0 A, and therefore low power consumption, eliminates the need for relays and permits the use of uninterruptible power supplies. Maintenance-free with double-lipped, grease-sealed bearings. 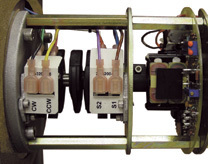 Dampers or valves may be operated at their individual locations with the built-in electric Handswitch. This saves time during installation and troubleshooting, allowing on-line adjustments to be made quickly and easily by bypassing the electronics in the drive and control system. 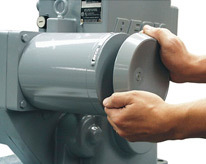 The Handswitch also serves as an electrical backup in the event of control system failure. SPDT switches rated for a minimum of 6 A at 120 V ac, (three times maximum motor current for most models) to ensure long life. Field-adjustable to operate at any point in the drive’s travel range. May initiate secondary functions or provide remote indication of drive position. 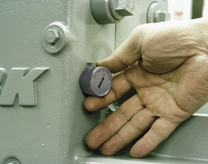 Eliminates unreliable and maintenance- intensive proximity switches.